In the 15 years since 9/11, it would almost be impressive how far the US government has gone to pursue secretive, constitutionally questionable surveillance measures if it wasn’t also so completely terrifying. One of the nastiest, yet somehow lesser-known tools in federal agencies’ anti-terrorism arsenal is the national security letter (NSL). Like all great Orwellian doublespeak, that’s a fairly innocuous term for a legal document that twists itself into knots to avoid the traditional system of checks and balances and give the FBI nearly unlimited spying power on American citizens who may be completely innocent of any crime. NSLs are actually administrative subpoenas. Unlike most subpoenas, which must be issued by a lawyer or court and thus are presumably subject to at least a little oversight and restraint, NSLs are ordered by federal agencies with nearly unlimited authority and without the involvement of a lawyer or judge. But it hasn’t always been like that. When the FBI was first granted the power to issue them in 1978, NSLs were only to be used to obtain financial records from a foreign power or its agent, and compliance was voluntary. You could receive one, ignore it, and the FBI couldn’t do anything to you. Then the Patriot Act was passed following 9/11. Suddenly the FBI could request any information “relevant” to an investigation, and it would no longer be limited to financial institutions. However, the requestable information itself is limited. The NSL requires that the recipient turn over non-content information, so if the FBI sends Microsoft an NSL wanting to know about emails you’re sending out, it will get the addresses of anyone contacting you and possibly some billing information, but it won’t actually see what’s in those emails. Getting that content would still require a search warrant that could only be issued be a federal judge. So the NSLs themselves are sort of fishing expeditions that can help the feds build a case based on a mere hunch. That’s all pretty bad, but perhaps the worst part of NSLs is the “nondisclosure agreements,” or gag orders, that they almost always come with. If the director of the FBI certifies, without any oversight, “that otherwise there may result a danger to the national security of the United States, interference with a criminal, counterterrorism, or counterintelligence investigation, interference with diplomatic relations, or danger to the life or physical safety of any person,” then the recipient of the NSL can’t talk about it. At all. And that gag order never expires. Merrill filed his lawsuit in 2004 as part of the case Doe v. Ashcroft, but under the terms of the gag order he wasn’t even allowed to reveal his name until 2010. And the government did eventually decide that it didn’t want any information from Merrill, though it kept the gag order in place until 2015. At least Merrill won a couple important victories along the way. In 2004, a district court held that the gag orders were unconstitutional because they could not be challenged. That forced Congress to rewrite the law to allow challenges. Another decision in 2008 by an appellate court required the FBI to show that not imposing a gag order really will harm national security. Despite these rulings, the FBI is still apparently issuing roughly 16,000 NSLs with gag orders each year, and courts are divided about their constitutionality. The 2013 Northern District of California case In re: National Security Letter found NSL gag orders to be unconstitutional, and the judge issued an injunction preventing them. However, she also immediately stayed her decision while it was appealed. When the case finally came up before the Ninth Circuit Court of Appeals last August, it was ordered back to district court for rehearing due to changes regarding NSLs in last year’s USA Freedom Act. It’s still pending. 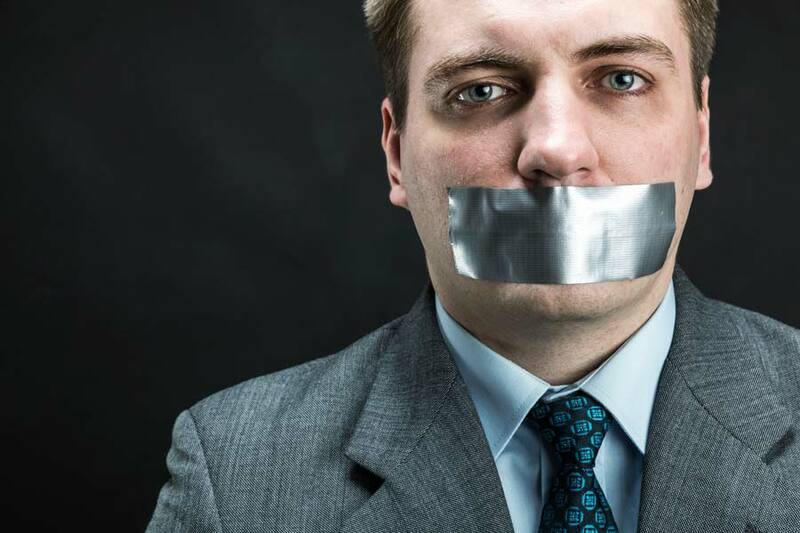 In August of 2016, an unnamed company challenged two NSL gag orders in DC District Court and received a ruling that the FBI must review the necessity of the gag orders every three years or when its investigation concludes. This was something of a compromise as the FBI complained that requiring it to review these gag orders annually would be “cumbersome.” At least the gag orders can no longer be in place indefinitely. “This is really only a tiny improvement,” Jeschke said. “It’s better than no review at all, but it’s still unconstitutional.” The problem is that there’s still little oversight in place to ensure the FBI is only pursuing gag orders in cases that really do involve issues of national security. Meanwhile, Microsoft, of all companies, is taking the fight directly to the feds. In April, it filed a lawsuit challenging the thousands of NSLs it has received and its inability to notify customers of them. The lawsuit itself is a huge victory for privacy advocates, but it already seems doomed. The DOJ has filed a motion to dismiss, arguing that because Microsoft isn’t challenging a specific NSL gag order, it has no standing to pursue its case. The problem is that, even assuming EFF is right on the merits of the case, the DOJ does have a really sound legal argument regarding standing. And if the DOJ ultimately prevails here (likely after several years and appeals), there seems to be little recourse here for the average Internet user aside from hoping that they’re not the target of an NSL, or that Microsoft will ultimately refile targeting a particular NSL. Faisal Kutty, a law professor at Valparaiso University and Osgoode Hall Law School said that Microsoft is challenging the gag orders under the First and Fourth Amendments, but neither of its arguments is terribly strong. Larger media outlets have mostly written smaller pieces on the issue, and political opposition to NSLs and gag orders is virtually nonexistent. Congress has pretty much written a blank check to the FBI to do whatever it needs to pursue NSL gag orders, and has only shown willingness to rewrite the law whenever there’s a successful legal challenge. There has been some discussion of changing the law to limit gag orders to six months, but this has received little traction. Meanwhile, neither major presidential candidate has addressed NSLs at all. Unfortunately, the complete lack of a dialogue means that the gag orders are mostly working right now, which only seems to drive home Microsoft’s point: there needs to be more openness about NSLs.